I can finally bask in some official fall weather. 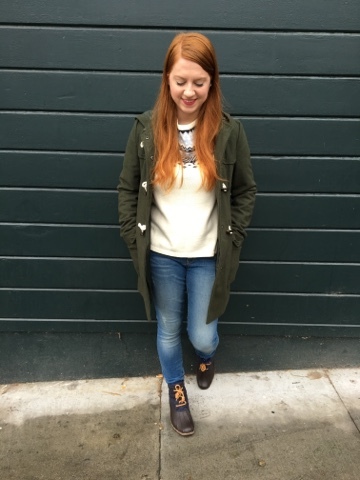 We’ve had such a long Indian summer here in SF that I started to think I would never get the chance to pull out my cosy sweaters and weather prepped boots. Then finally, out of nowhere, I started to feel a chill in the air. Hurray! Then, the rain started and I knew I needed to go out prepped and ready. It’s been raining on and off for the past few days, which has put me in such a great mood lately. I have a serious thing for the rain… dark clouds, thunder, lightening, being cosy inside, etc. The rain gave me just the push I needed to pull out a few new rainy weather favorites. I’m so happy it’s finally cold enough to officially call it sweater weather. I can pull out and add to my collection of favorite fair isle sweater pullovers. My newest sweater favorite is from Lands End. It’s a great sweater to bundle up in and wander around outside, enjoying a late brunch, but it’s also light enough that it’s perfect for layering. I definitely plan to layer it over a few button down shirts for work. 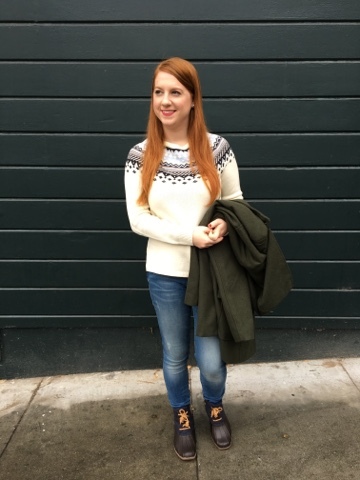 The blue and black fair isle pattern on the top of the crewneck cut adds the perfect fun detailing and kinda makes me look like a little snow bunny, which I love. It makes me feel like I should be skipping work to hit the slopes. With all that falling on and off, I knew I would need a thick jacket to keep me warm. I pulled out my new favorite cold weather coat that I picked up a few months back during the Nordstrom’s Anniversary sale. With roped toggles (I’m toggle coat obsessed) and a hood to keep off the rain drops, it’s perfect for layering up against rain or wind or snow. As for rainy day footwear, I know I love my hunter wellies. They’re packable, so comfy for long wear and are super cute to boot. But sometimes, I need something that’s a little shorter and a little bit more rugged. That’s where these dark Sperry saltwater duck boots come in. 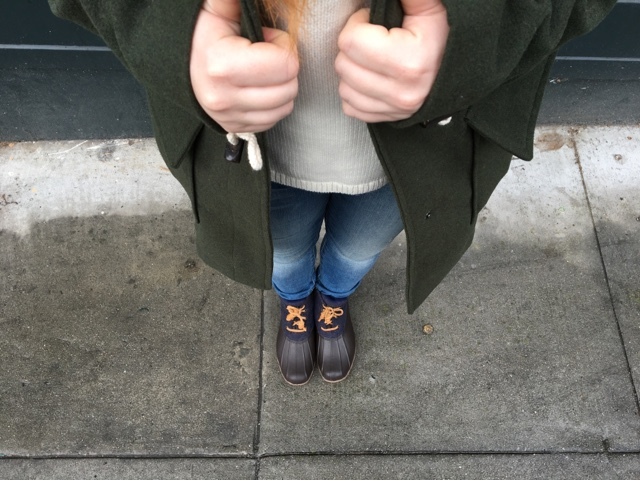 Another reason to get excited about rainy weather, these duck boots make you want to jump through poodles and run through snow. The quilted wool keeps my feet warm, dry and cosy and the rugged sole keeps me from any embarrassing slips, which let’s face it, is SO necessary. All in all, I’m ready for you cold weather. Bring it on. 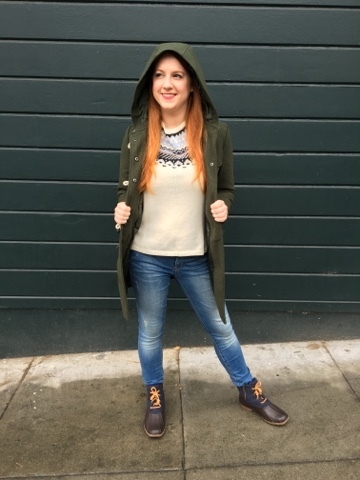 Have a favorite rainy day look? Share with me in the comments below! Very cute look.. I have a similar jacket and I have gotten a lot of use out of it! Such a cute outfit! I love it! I honestly don't own any jackets like that, but I'm definitely going to look more into it because I love it! I just love the entire outfit! I want a pair of those boots so badly! Pretty good and suitable choice according to the fashion and also for specifically a rainy day. Really a gorgeous and amazing outfit for a rainy day. Thanks for sharing.